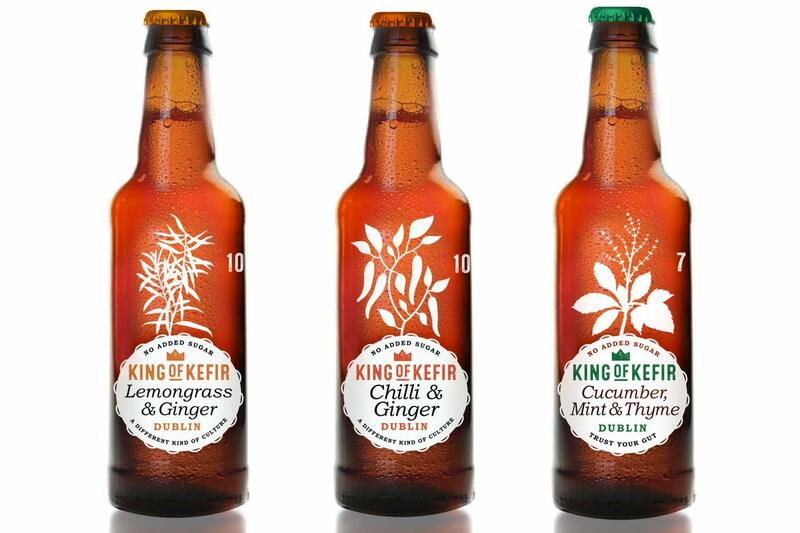 King of Kefir’s hand crafted healthy Lemongrass & Ginger, Chilli & Ginger and Cucumber, Mint & Thyme flavours are our refreshing fermented drinks using real ingredients with a gentle fizz. Naturally full flavoured, teeming with gut friendly bacteria from the water kefir. Includes a wide range of organic acids, lactobacillus, vitamins, enzymes and antioxidants. Sweetened naturally with extract from the Stevia plant. It is delicious as an alternative to other soft drinks. Added bonus is that it is less than 10 Calories per bottle and contains no caffeine. Our drinks are refreshing, delicious and naturally flavoured water kefir. Hand crafted by fermenting the kefir grain in water rather than milk. These vegan friendly alternatives are perfect for those looking for all the benefits of live cultures but which are normally limited to dairy products. Each bottle contains less than 10 Calories, lightly sweetened with the extract from the stevia plant and are made using triple filtered water, natural ingredients and contain no stabilisers, emulsifiers or preservatives. The fizz is created naturally in the bottle by the water kefir culture and through the addition of a small amount of apple juice. Up-turn the bottle before pouring to release all the flavours. Lemongrass & Ginger: real ginger juice, apple juice, lemon juice, lemongrass, water kefir culture and turmeric. Turmeric adds some colour and a hint of an earthy warmth to the taste. Chilli & Ginger: real ginger juice, apple juice, lemon zest, birds eye chilli, spices, sea salt and water kefir culture. Cucumber, Mint & Thyme: honey, cucumber juice, mint, thyme, salt, spices and water kefir culture. Founded in 2013 by Gerry Scullion who wondered why there were many craft beers but no healthy craft drinks. He set out to change this with a passion for brewing craft drinks. After months of experimenting, the breakthrough came when Gerry added water to kefir grains. The result was a clear drink with a mild fizz and natural bacteria cultures. Water kefir is a live culture fermented beverage which is teeming with beneficial gut friendly bacteria and yeast. We have a simple ambition to produce healthier, light and refreshing alternatives to high sugar or artificially sweetened soft drinks. All flavours are only slightly sweetened by the extract from the stevia plant. Using organic and/or fair trade ingredients where available and hand crafting all water kefir drinks in small batches. Perfect used as mixers or drank refreshingly on their own with some ice. See our infographic for mixer ideas. Free from Dairy and gluten with no added sugar, suitable for a diabetic, coeliac and vegetarian / vegan diet.